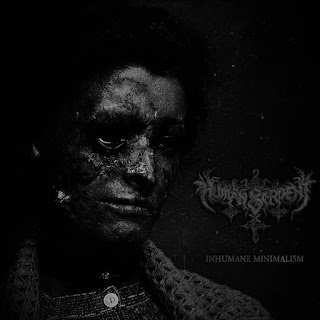 Human Serpent are a band from Greece that has been featured before in this zine and plays a raw and misanthropic form of black metal and this is a review of their 2015 album 'Inhumane Minimalism" which was released by Self Mutilation Services. A very fast and raw black metal sound starts off the album along with a decent amount of blast beats and high pitched screams and the vocals also get very deep at times and the songs also bring in a great mixture of slow, mid paced and fast parts the solos and leads bring in more of a modern style of black metal. A lot of the fast tremolo picking riffs bring in a 90's style of black metal and there is also a small amount of melody being used at times and there is also a brief use of spoken word parts and whispers on one of the tracks and the vocals at times also bring in depressive elements and the whole album avoids using any solos and leads to focus more on a very raw and misanthropic style of black metal. Human Serpent creates another black metal album that remains true to the raw and misanthropic style of previous recordings, the production sounds very raw and heavy while the lyrics cover misanthropy, nihilism and anti christian themes. In my opinion this is another great sounding recording from Human Serpent and if you are a fan of this band, you should enjoy this album. RECOMMENDED TRACKS INCLUDE "The World In Coffins" "Starving Void Upon Earth" "Funeral Grimness' and "Mother Of Depression". 8 out of 10.